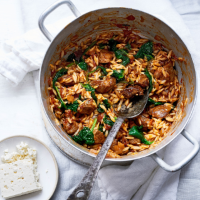 A traditional Mediterranean one-pot supper. 1 Heat 1 tbsp oil in a casserole and brown the lamb in batches (adding more oil if needed), until golden; set aside on a plate. Add the onion and sauté for 5-10 minutes, until soft. Return the lamb to the pan, then stir in the rosemary, allspice and bay leaves. Cook for 1 minute, then add the tomatoes, stock, honey and salt. Bring to the boil, then simmer for 15 minutes. 2 Meanwhile, rinse the orzo under cold water, then cook according to pack instructions. Drain, then rinse again under cold water and stir it into the casserole. Rinse the spinach and stir into the casserole too, until it wilts. Cover and set aside to rest for 2-3 minutes, then remove the bay leaves and serve, sprinkled with the feta.